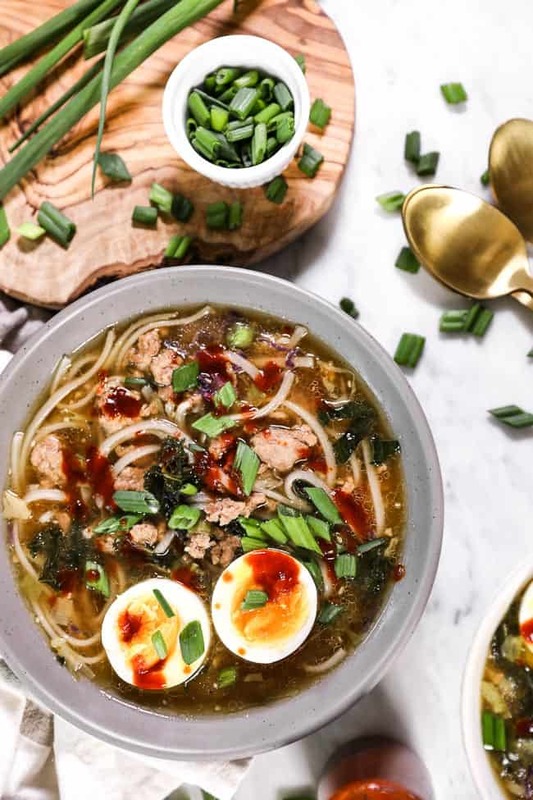 Doesn’t a bowl full of pork ramen noodles just sound cozy? 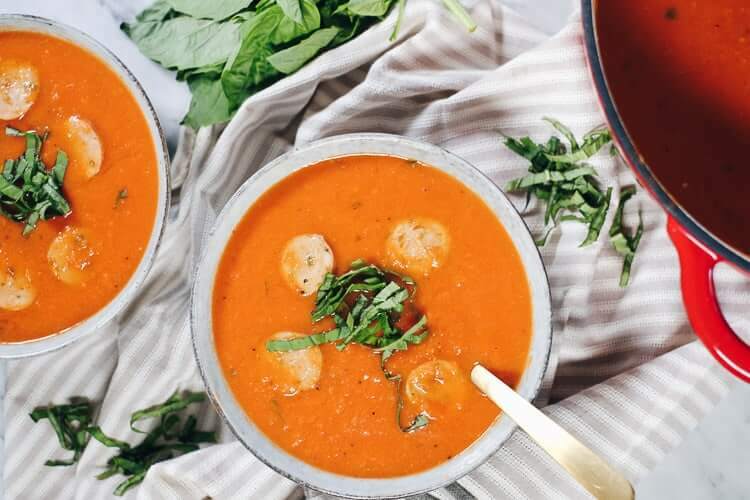 I’m a big fan of healthy soups and also a big fan of comfort food. 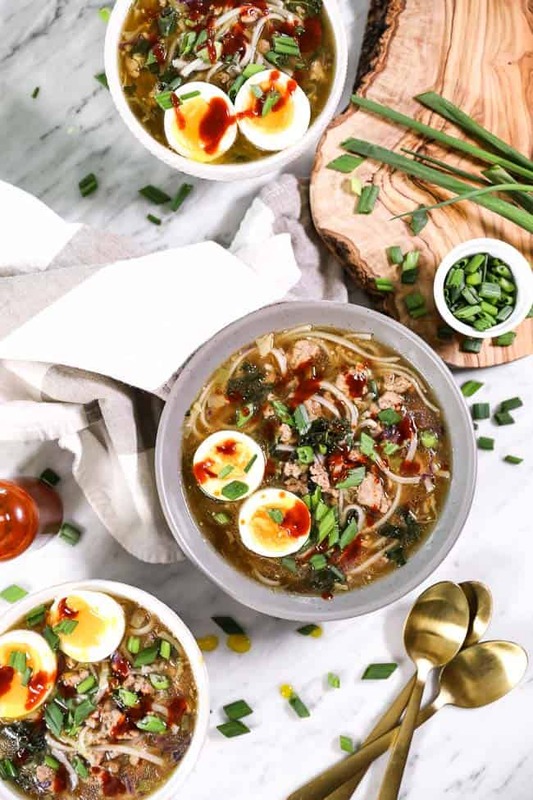 This Paleo + Whole30 pork ramen makes me feel all warm and cozy. 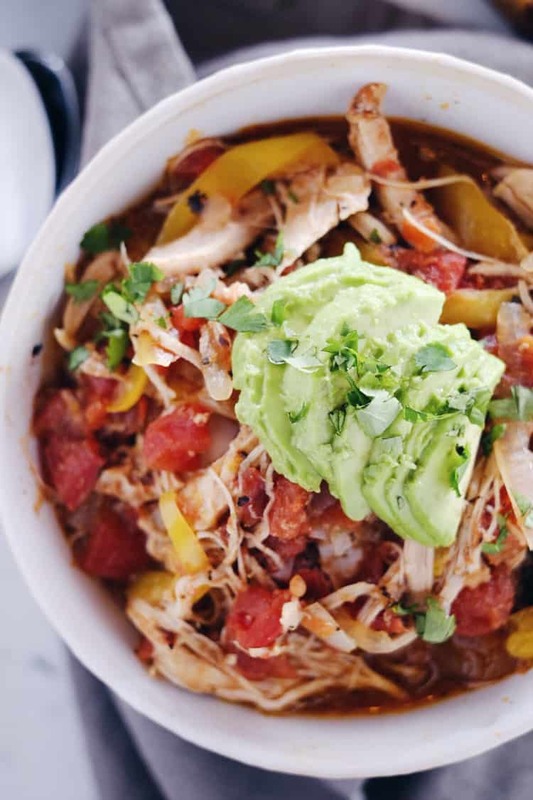 We even have some low carb, Keto options for you, too! If you haven’t noticed…I’m a lazy cook. It’s true. I don’t like to spend THAT much time preparing a meal. Or if I do, it better put some leftovers in the fridge to cut down on cooking time another day. 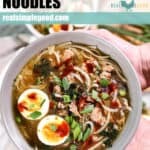 Well, these pork ramen noodles are both quick + easy AND make leftovers! You’ll be enjoying this meal in 30 minutes and have some in the fridge for lunch or another dinner. Win-win! Love it when that happens! The key to delicious pork recipes is finding a good source of quality meats. We’ve been loving Moink to help supplement our freezer when we run out of the pork and beef we get from the pigs and cows Justin’s mom raises. 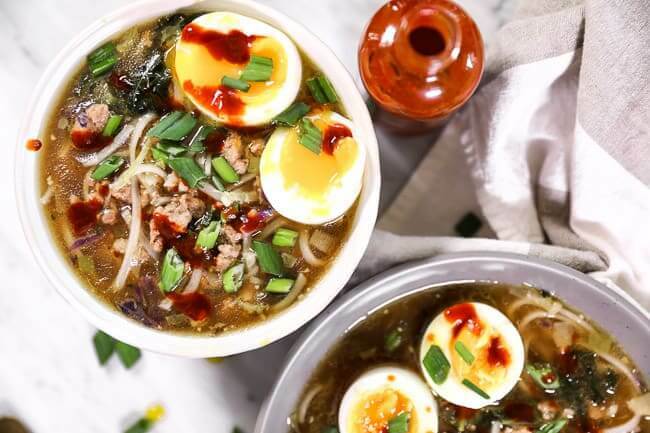 It’s been so great having quality cuts in our freezer and being well-stocked, so quick + easy meals like this pork ramen can happen on the regular! We teamed up with our friends at Moink to bring you a special discount code since we’ve enjoyed their products so much! Enter the code REALSIMPLEGOOD at checkout to save $20 off your first box! In these pictures, we used rice noodles we found at a local health foods store – they’re Thai Kitchen brand and the ingredients are just rice and water. They come dry and you add them right into the soup to soften and cook. 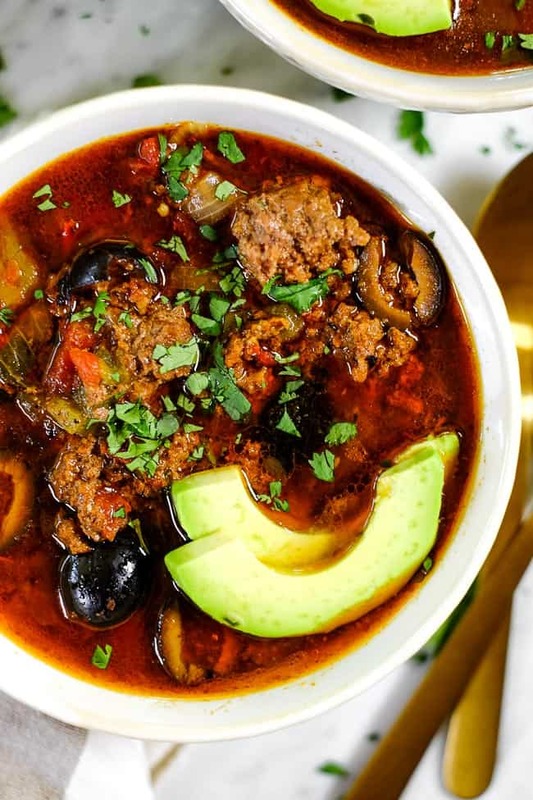 Another option would be to use Cappello’s paleo-friendly noodles. If you’re doing a Whole30 or trying to eat Keto/low carb, then use zucchini noodles instead. It’s an easy swap that will keep you on track with your own personal goals. 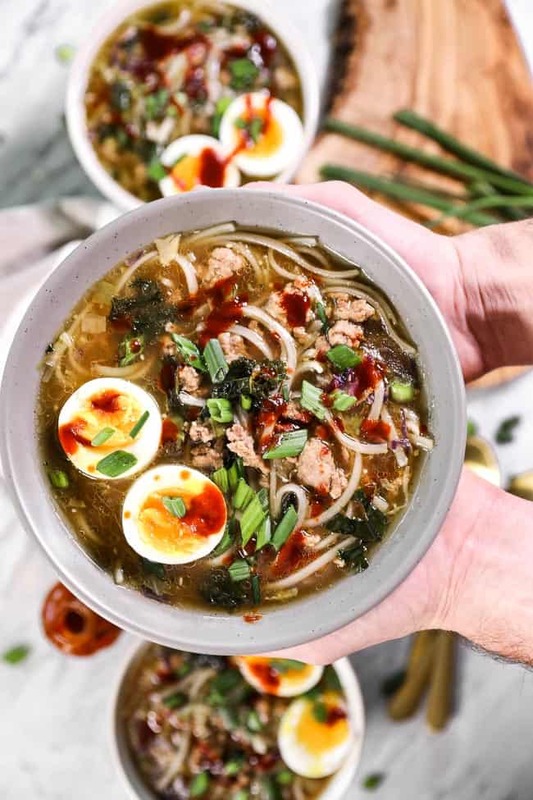 Add these pork ramen noodles to your meal plan for the week! They’re great for a satisfying, quick + easy meal! Leave a comment below and let us know how it goes. Also, take a pic to share on Instagram! 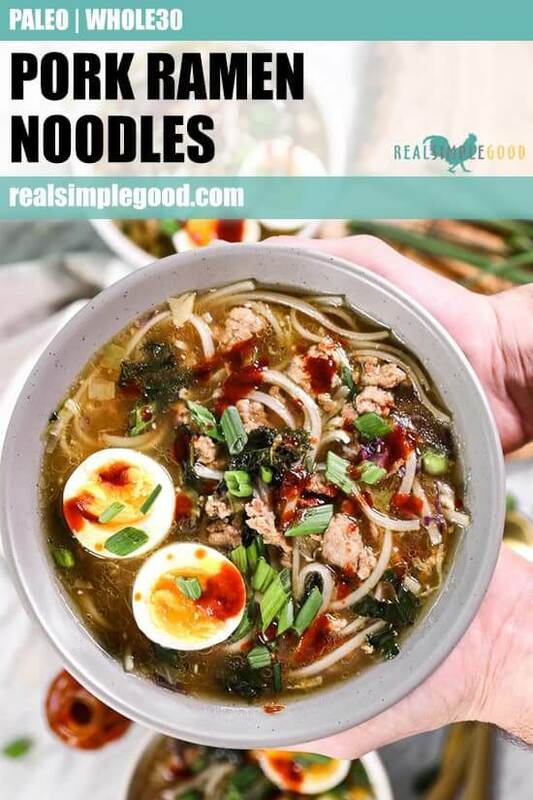 Tag us @realsimplegood, and give us a follow if you don’t already. We’d love to stay connected! 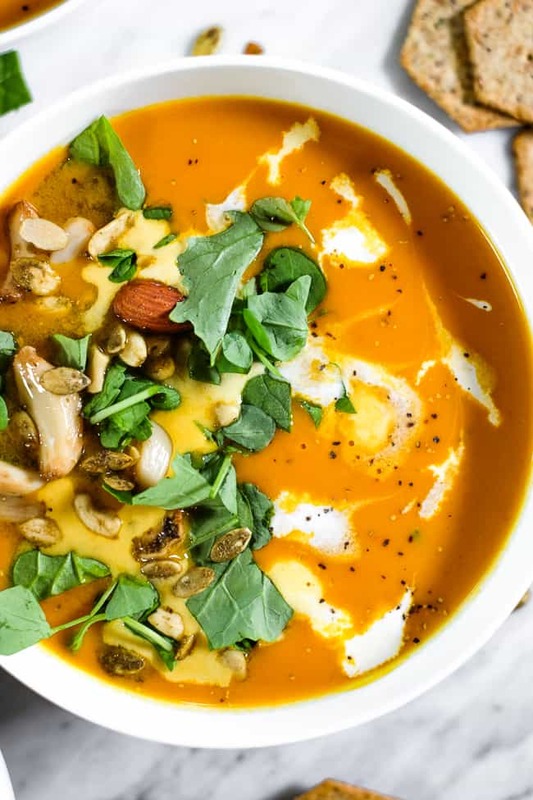 I’m a big fan of healthy soups and also a big fan of comfort food. 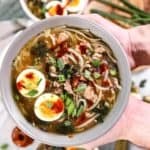 This Paleo + Whole30 pork ramen makes me feel all warm and cozy! Heat a large stock pot over medium heat and add pork. Cook, stirring occasionally, until the pork is almost cooked through, about 6-7 minutes. 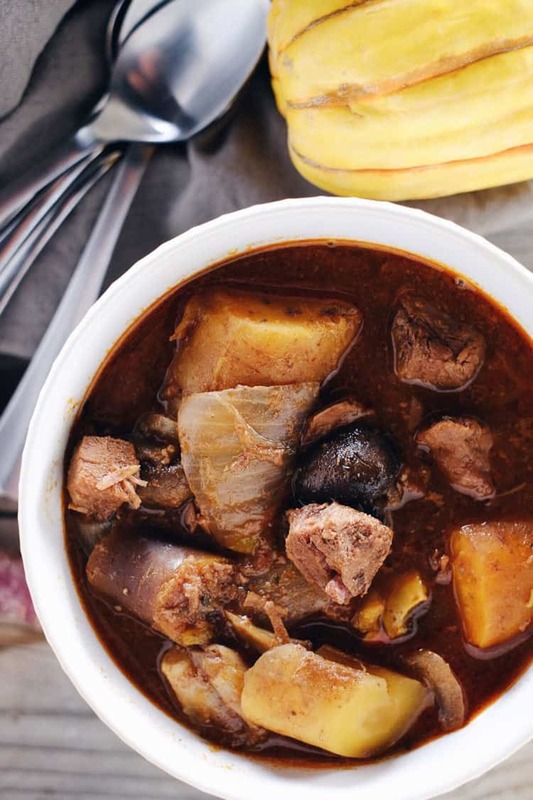 While the pork is cooking, prepare the onions, garlic, ginger and kale or cruciferous veggies as noted. When the pork is almost browned, add in the white part of the green onions, garlic and ginger. Stir and cook for 1-2 minutes. 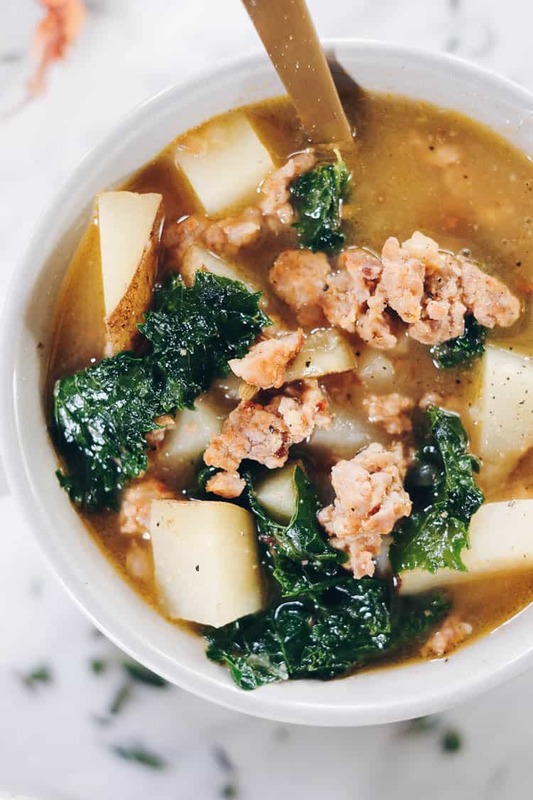 Add the kale or cruciferous veggies, coconut aminos, apple cider vinegar, fish sauce and beef broth and bring the pot to a low boil. Turn heat down and stir in noodles, continue to cook until noodles are tender. 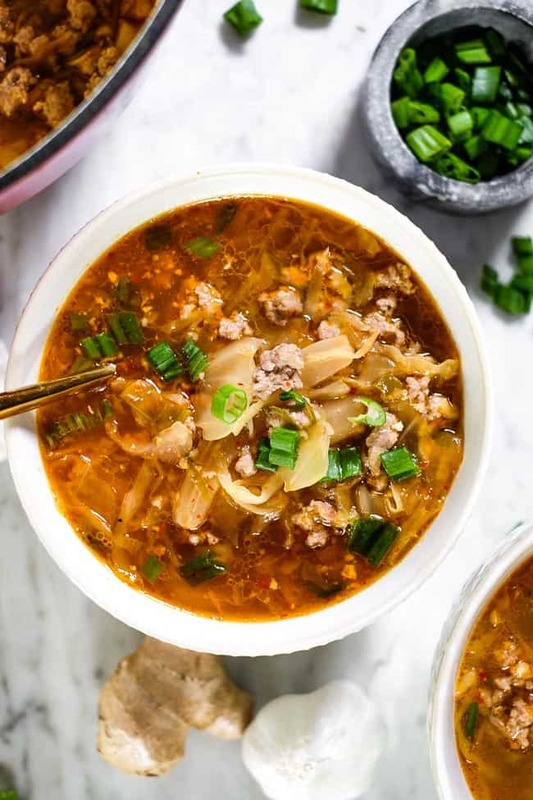 Ladle soup into bowls and top with diced green onion and any optional toppings. Serve and enjoy! Soooo good and so fast! It really only took me 30 mins to make this! 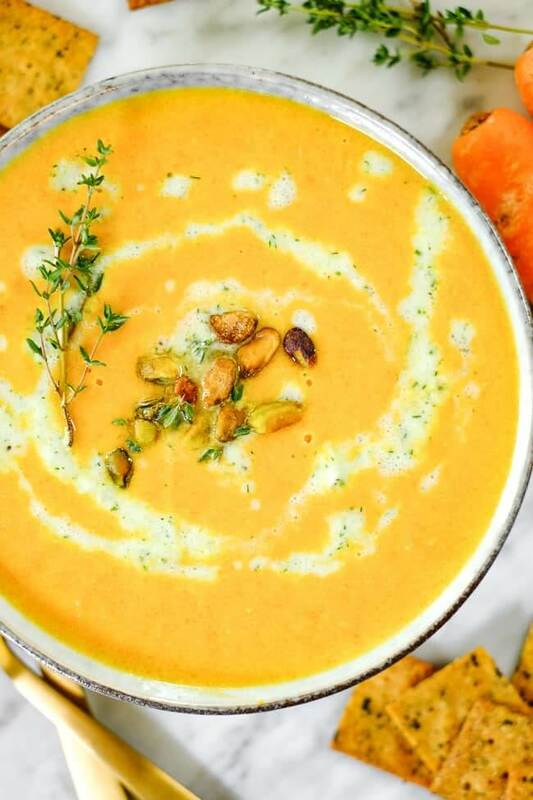 Amazing healthy soul warming deliciousness. I actually made it with both spiraled zucchini and rice noodles and it was perfection. This is another monthly staple added to my recipe mix. This recipe is fantastic. I added sliced mushroom and used spaghetti squash noodles. I couldn’t wait to eat leftovers for lunch the next day!